A permanent mooring must remain secure for long periods while unattended, occasionally under adverse conditions. For peace of mind, it should be properly sized for the job. Below are the basic components. Anchor: The most common type of mooring anchor is the mushroom, which, under ideal conditions, can dig in, create suction and develop good holding power. A weight of 5-10 times boat length is a good rule of thumb. The heavier the better, as long as you don't have to move it. Heavy objects like concrete blocks and engine blocks can't dig in, so their holding power is not as great. Chain: A fine recommendation is two sections of galvanized chain: a heavier, primary chain and a lighter, secondary chain. The primary (ground) chain lies on the bottom. Its length should be 1 1/2 times maximum water depth. The secondary (riding) chain, is connected to the ground chain with a galvanized shackle or swivel. It's usually half the size of the ground chain and equal in length to maximum water depth. 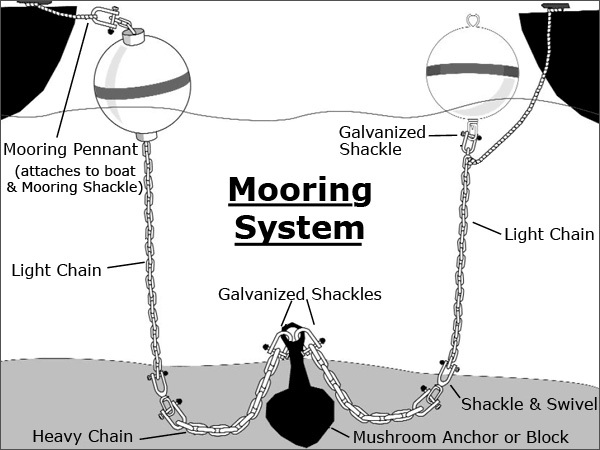 The heavier chain is not used for the entire run so that the mooring buoy does not have to support an excessive amount of weight. Chain should be as large as possible-make the riding chain at least double the size of the chain on your anchor rode. Buoy: The buoy must have about twice as much flotation as the suspended chain has weight in order for it to ride high enough in the water to be visible. The Taylor T3C buoys on this page allow you to pass the chain through the center of the buoy, and attach the pennant on top. Pennant: The pennant attaches the chain to the boat. Large-diameter 3-strand nylon line is used because its inherent elasticity allows it to act as a shock absorber. Polyester line or stainless steel wire is preferred by some for better chafe resistance. Length should be about 2 1/2 times freeboard. Diameter should be as large as is practical-it must be able to fit through bow chocks and around a bow cleat. Chafe protection is recommended for the point where the pennant passes through a chock. A light pick-up buoy at the boat end makes it easy to grab the pennant.